This bike is called ‘Hoon’ and it was created by Shinya Kimura, one of the champions of ‘Zero Style’ – minimal interpretations of vintage motorcycles, with low-key paintjobs and Harley-Davidson springer front ends. Kimura set up Zero Engineering in Japan in 1992, but now runs Chabott Engineering in Azusa, California. 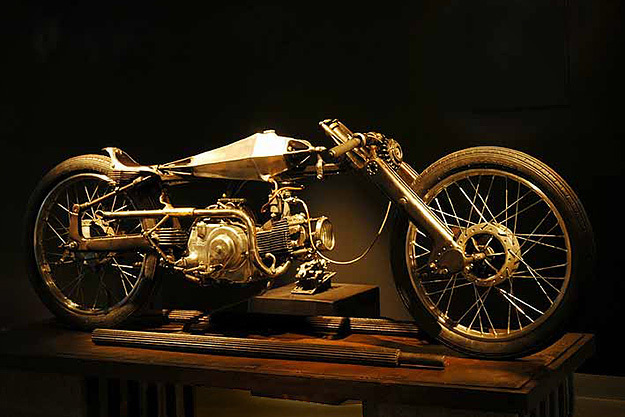 Like Chicara Nagata, Kimura is treating the motorcycle as art, and the approach is paying off. There’s a Jules Verne, steampunk tinge to Hoon that we love.